As admirably ambitious as the series opener. But Books #2 and #3 of the Daughter of Smoke of Bone trilogy are let down by being structurally-flawed and overlong. 3/5 stars each. What it’s about: this is a tale of demons and angels, star-crossed lovers and war. I won’t say more to avoid spoilers, but you can get more a feel for the series from my review of book 1: Daughter of Smoke and Bone. 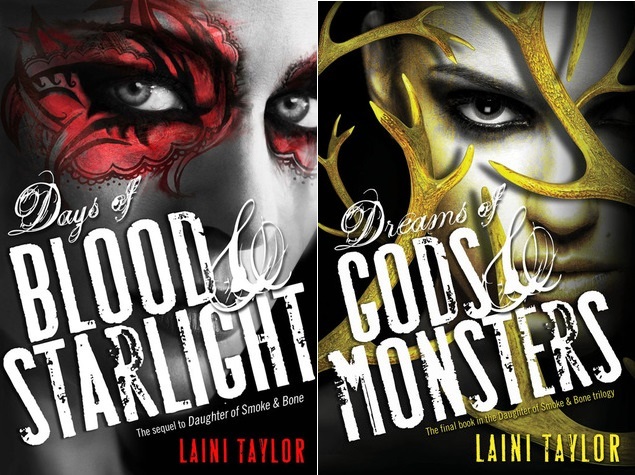 I want to start with praise for the ambition of Laini Taylor’s series. The author has aimed for an epic storyline. One which is founded upon an interesting inversion (and then complication) of traditional notions of good and evil. The idea is brilliant. The writing style is consistently good, at times excellent and bordering on poetic (whether this is always appropriate is another matter). My issues are mostly structural. Days of Blood and Starlight (Book 2) is over 500 pages long. And yet, when I finished and thought about what had actually happened in those 500 pages, I realized they could have easily been told in 340! There is a lot of repetition and unnecessary navel-gazing. My other big issue with Book 2 was our protagonist’s blindness. At points they are so clueless as to what’s going on, I started to wonder if they were stupid. For example [SPOILER]: how does it take Karou so long to figure out Thiago still wants to kill her? Of course he does! You can see it in his body language in their first interaction! Moving onto Book 3: Dreams of Gods and Monsters should have been 2 books. There, I’ve said it. Why? Because you don’t introduce both a new character (Eliza) and another entire group of characters (the Stelians) who are crucial to the denouement of a series in the last book! And if that last book is over 600 pages, then you can easily divide it in 2, and introduce all these characters in Book 3. Then you use Book 3 to make us care about them, rather than just being annoyed with them for taking us away from the characters we’ve come to know and love in the previous installments. And finally, you can finish the series in Book 4, with a cast of characters your readers are invested in. My other big issue with the series as a whole is the star-crossed lovers storyline. I would have been on-board with it if I could see any true foundation to the relationship. Things in common, time spent together, etc. But no. In true Romeo and Juliet style, their eyes meet and that’s it. Which is fine if, like in R&J, this is the backbone of a play which lasts a couple of hours. But not if the relationship has to underpin the action of 3 enormously chunky books. Overall: in the end the series is just ok. Which is a shame and missed opportunity. It could have been brilliant if it had been 4 books instead of 3 and undergone a more ruthless structural edit. My thoughts exactly. I was disappointed with book 2 but thought ok I’ll continue, maybe it gets better. I got halfway through book 3 and had to re shelve it. Should’ve been a stand alone in my opinion. Exactly! Continuing with the series was a mixture of disappointing and infuriating because I could see a great book(s) lurking behind all needless baggage. I forgot to say in my review (I forgot to say a lot because otherwise it would have turned into a very long, unproductive rant!) that the start of Book 3 is particularly annoying because she uses the first 30% of the book just to get us to where she finished Book 2! Ugh! And all the extra characters and sub plots just turned me off. I know. And it’s not like when I see a film and think, “That should have been 20 minutes shorter, but I couldn’t say where to cut the 20 minutes from.” With these books I could have said where to cut, and the cuts wouldn’t have hurt the story at all.